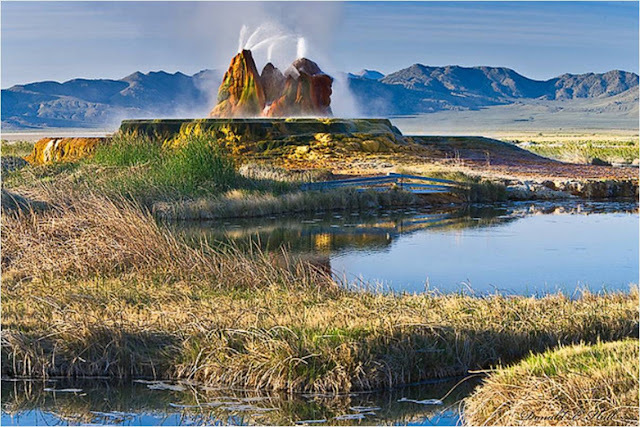 The geyser can be found in Hualapai Valley near Gerlach. It is a little seen phenomenon as the land upon which it sits is private. It can be seen from State Road 34 but unless you have permission the view from a distance is all you should attempt. Back in 1916 the owners of the place were looking for water in the hope of creating rich farmland in this desert area of the state. They came across water, yes, and the well worked for decades. 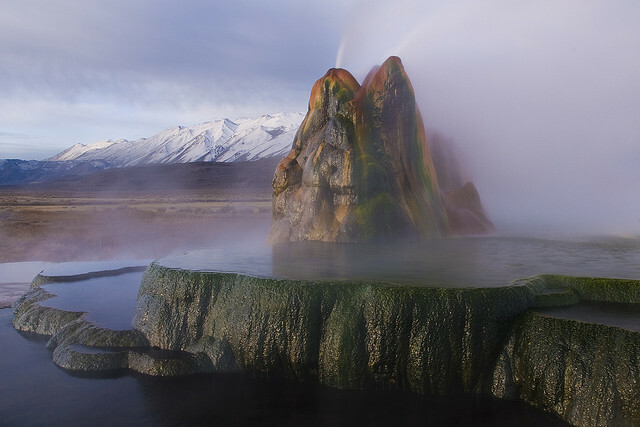 However, the drill that was driven down a shaft hit a geothermal pocket of water and the result was a geyser, if not quite made by man then certainly made possible by him. 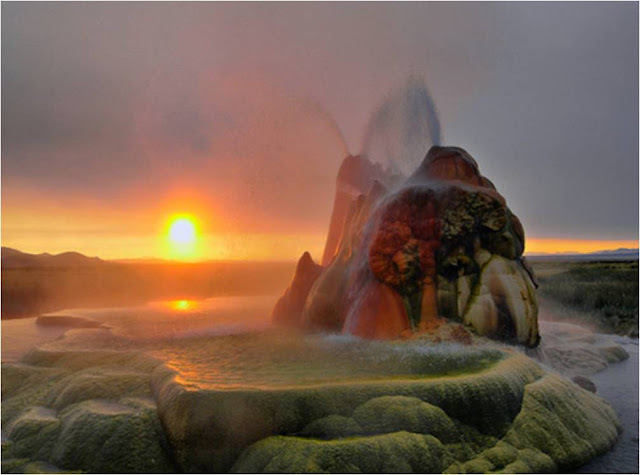 Yet it is not the geyser you see in the pictures here. 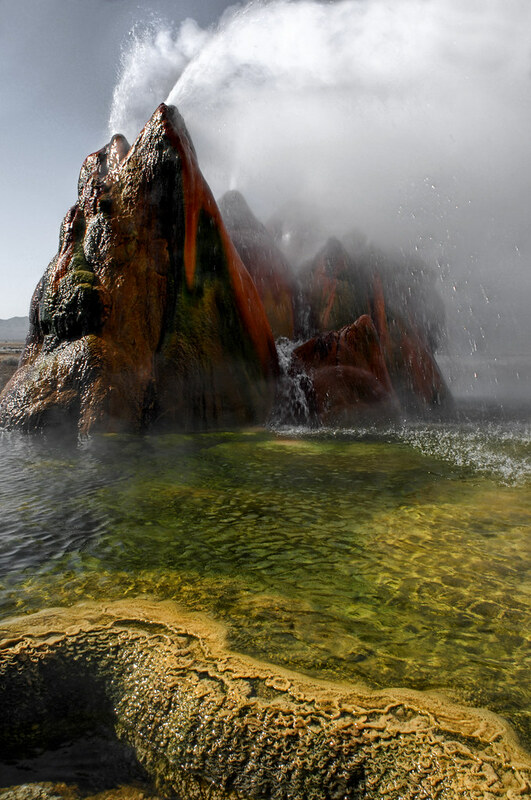 In the 1960s the water found another weak spot and a new, natural geyser was created. The older one no longer spouts at all. 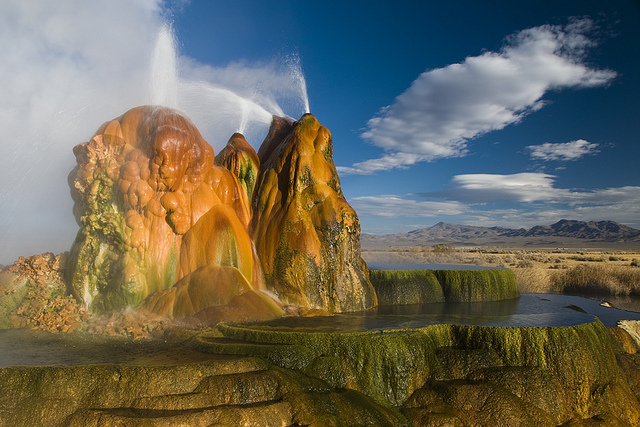 It is thought that the new geyser somehow diverted its water. Or perhaps it simply waits for another time to come when it can spring in to life again. 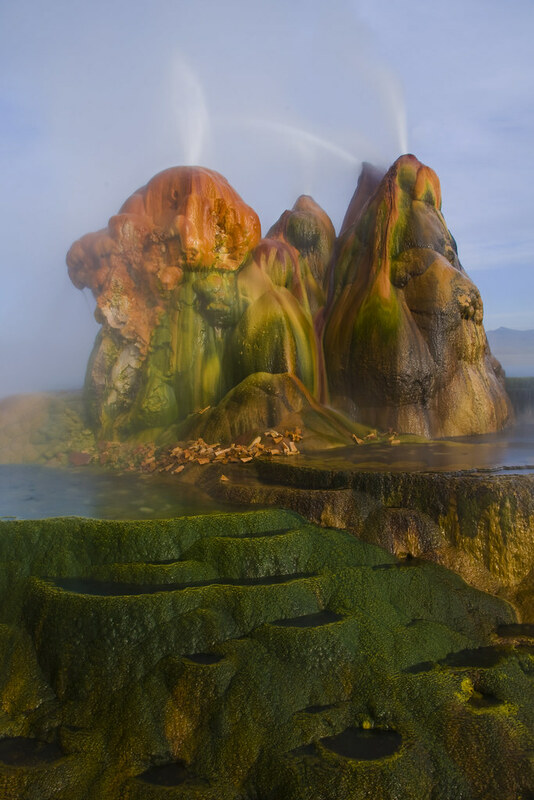 Since the 60s the geyser has substantially developed – it now has the appearance of a huge multi-colored sculpture. It sits upon a pulpit of sludge and dirt. 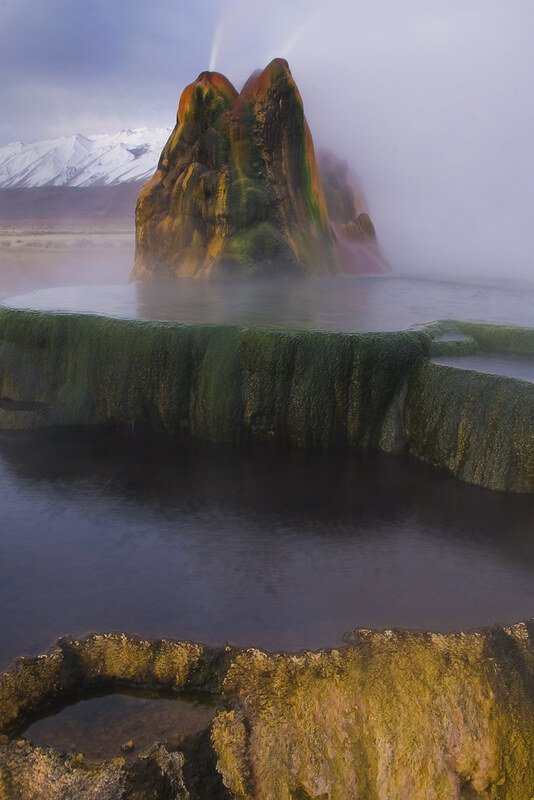 Around it ponds of warm water where plant life thrives give it an even eerier off-world look. The ponds are forming an ecosystem of their own. Small fish (introduced by some unknown human hand) breed in the ponds and they attract a number of birds such as swans, mergansers and mallards. 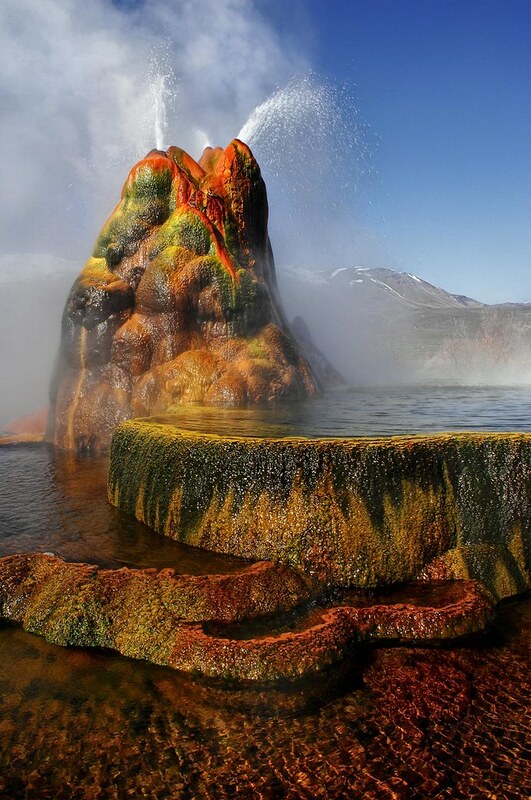 The odd yet magnificent appearance of the geyser is due to dissolved minerals slowly intensifying and then piling up. 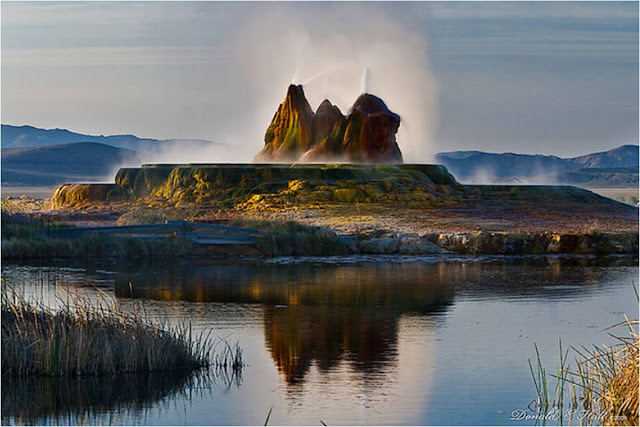 This created the embankment upon which the geyser sits and it is what gives the whole structure its size. 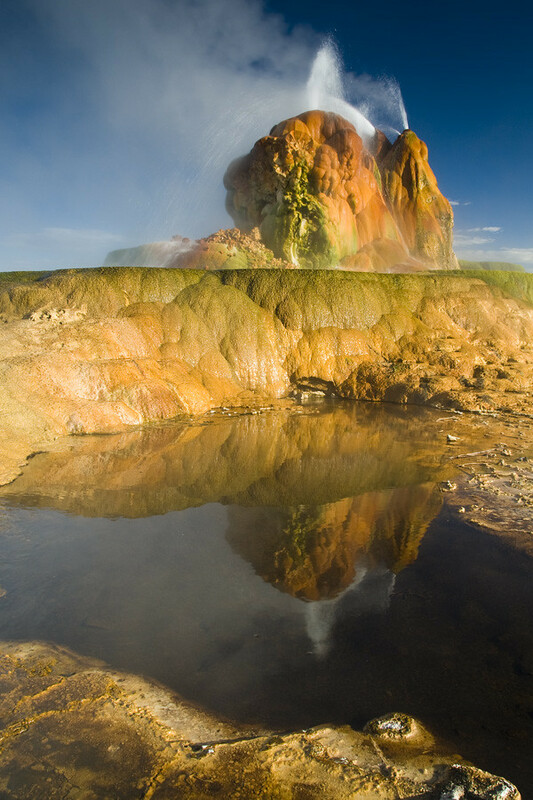 If you count the mound it is almost four meters in height: without it, Fly Geyser would be less than two. 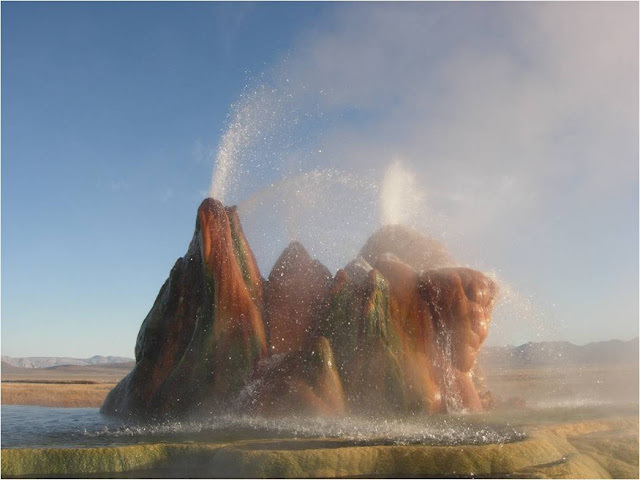 The water from the geyser is thrust skywards on a continual basis. 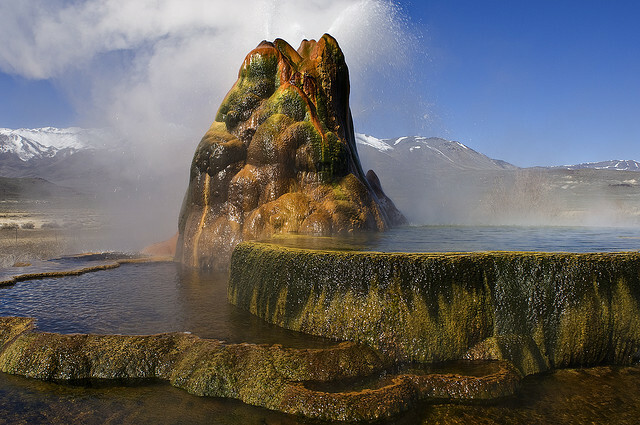 The spouts of water squirt out two meters in the air, spraying the surrounding thirty or more pools with a fresh source of water. 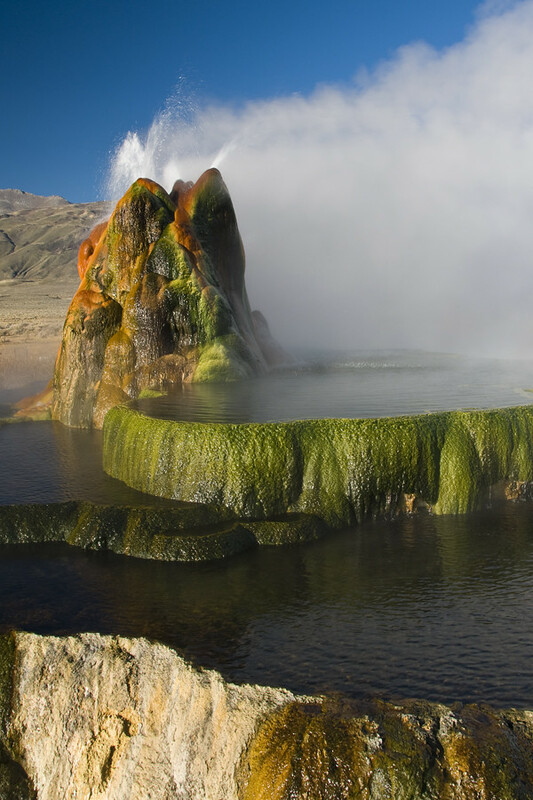 The different mix of minerals (which includes sulphur) reacting with the oxygen in the air help to give the geyser its glorious colors. 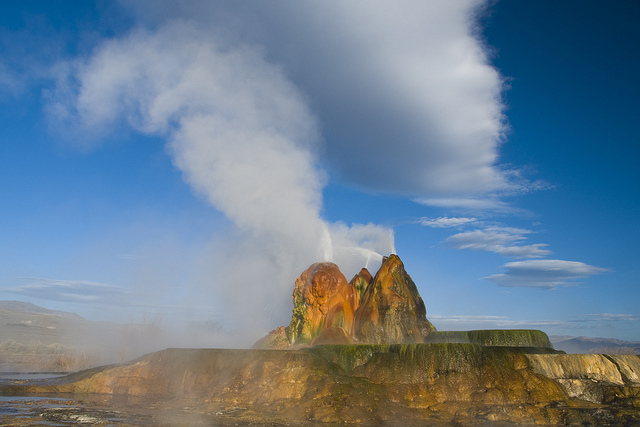 The multiple spouts mean that a single cone of enormous size has not been able to develop. 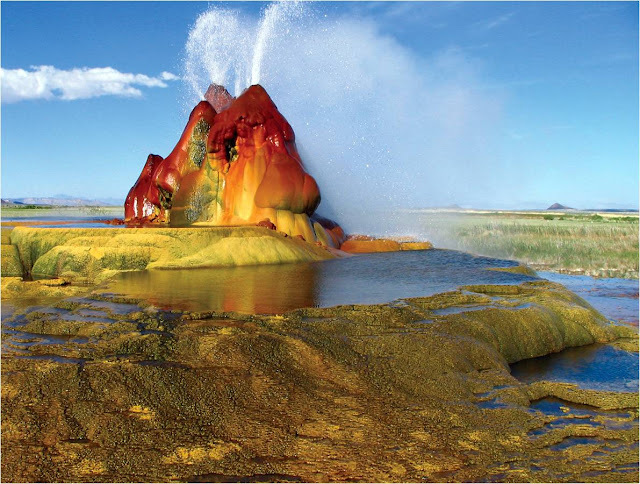 Yet the alien looking mound is something quite extraordinary, especially with its myriad of colors. 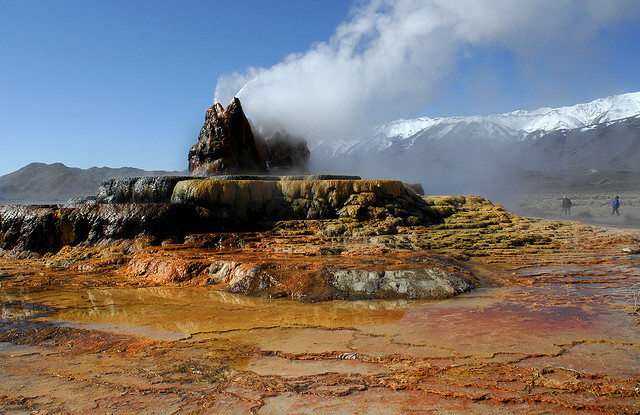 The other factor in the strange coloration of the mound is the fact that it is covered with thermophilic algae which as a heat tolerant microorganism thrives in this sort of hot environment. Although several organisations have attempted to purchase the land to open it up to the public the owners have resolutely refused. The land remains resolutely private and bordered by a fence. If you are ever in the vicinity then please do not attempt to get past the locked road gate – in Nevada that could have repercussions! Kuriositas would like to thank the following Flickr photographers for their very kind permission to use their pictures here. Please do not reproduce these pictures. Do visit their amazing Flickr photostreams and websites by clicking the links below.